I am so excited to have Samantha from Sweet Remedy here today to share her Tarts with you. I have followed Sam’s blog for a while and love her recipes – she has such delicious food, sweets and drinks. She also takes the most gorgeous photos. I hope we can finally meet in real life soon. In addition to the Sweet Remedy Blog, you can find Samantha on Facebook, Pinterest and Twitter. Hello Love and Confections Readers! I’m so excited to be posting here today. Before we talk about these Cranberry Pear Mini Tarts, I’d like to congratulate Mr. and Mrs. L&C on their new beautiful addition, Baby Grace! She is a complete little bundle of joy and I’ve loved seeing all the photos of their journey! Well wishes to your new little family! To celebrate, I’ve made these mini tarts in the tiny tart pans that I love so much. Tiny tarts for a tiny baby girl! 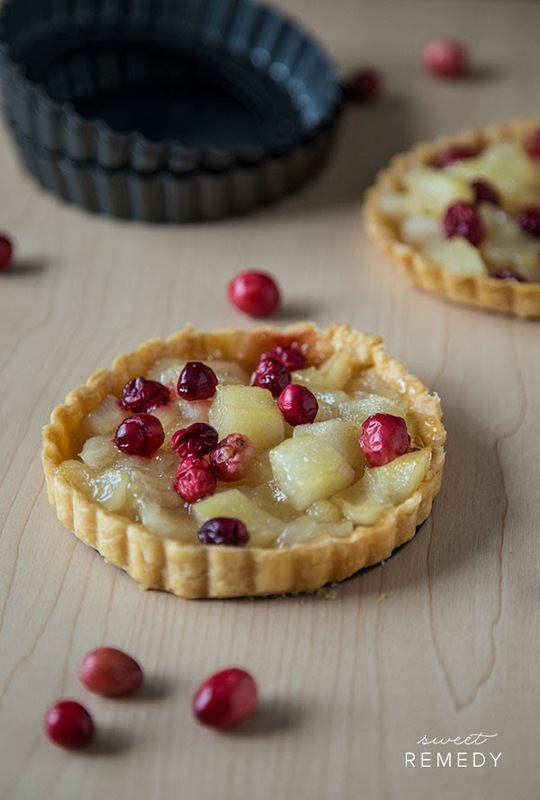 The tart cranberries compliment the sweet pear filling quite well in this dessert. The pop of red is also so pretty and festive for winter. Whenever I see cranberries in the store, I gravitate towards them and they end up going into the cart. After I get them home I start to dream up some new creative recipes, these tarts are exactly that. If you have a large tart pan, feel free to use it in lieu of the mini pans. A mini tart pan set usually contains six little pans but in this recipe you will only have enough dough for four. I struggled not to eat all four tarts after they came out of the oven. For the Filling: Add the pears to a medium sized pot – turn heat to medium-high. Mix in the sugar & water, add the cornstarch and mix together leaving on medium-high for about 10 minutes, mixing often. Mash the pears while stirring. If the mixture is too watery, turn the heat down to low and let simmer for a few more minutes. Set aside until dough is complete. Preheat oven to 350 degrees F. In a food processor, blend together the sugar and butter. Add the salt. Cut butter into quarters and add to dough. Mix thoroughly and remove from food processor. Form a ball shape and chill in the refrigerator for at least 30 minutes. Leave in overnight or freeze for longer storage. If freezing, remove and defrost an hour before use. Spray tart pan with cooking oil or smear with butter. Press dough into tart pan (or mini tart pans) Poke holes into dough with fork. Place parchment paper on top of dough and add rice or beans as a pie weight. Cook for about 20-25 minutes or until tart shell is lightly browned. Add the pear filling to the tart shell and add the cranberries to the top of the mixture. Bake until cranberries burst. Alternatively, you can cook the cranberries with the pears in the original pot.